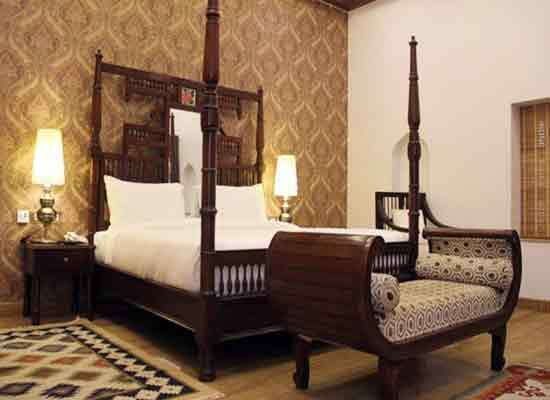 "A haveli turned heritage hotel, WelcomHeritage Haveli Dharampura is one of the best heritage hotels in Delhi, offering a memorable stay to the guests amid all the world comforts. Located in Gali Guliyan, this property is quite close to a number of popular attractions in Old Delhi. 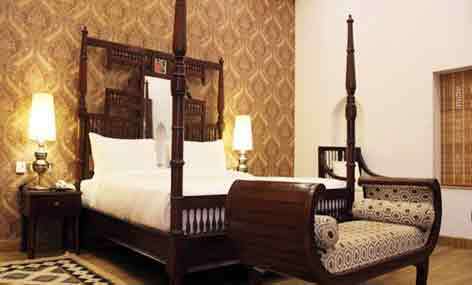 The haveli boasts of an old-world charm, which has been combined with various modern facilities like Wi-fi, library, LCD TV and more. Guests can also partake in a number of outdoor activities. 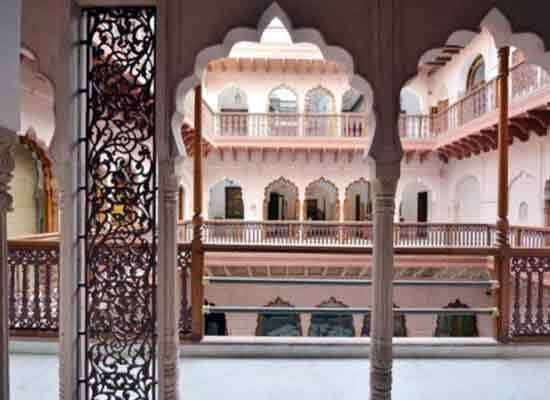 Boasting of a wonderful late Mughal-style construction, Haveli Dharampura also has touches from the architecture of 20th century. During Mughal and late Mughal reign, several courtiers erected a huge number of havelies. 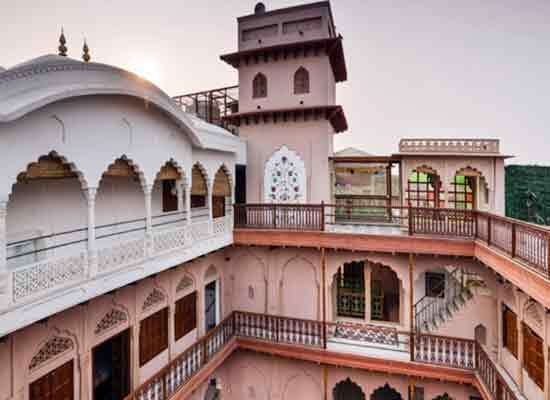 This haveli was constructed in 1887 AD, with a combination of commercial and residential pattern. It is placed quite close to the historical Jama Masjid. Multi-foliated arched gateway, balconies, wooden doorways, carved sandstone façades, brackets, jharokhas look amazing. 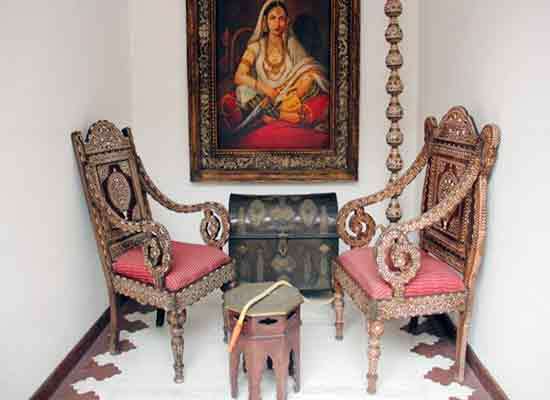 WelcomHeritage Haveli Dharampura, Old Delhi has a total of 13 well-equipped, spacious and airy guest rooms and suites. 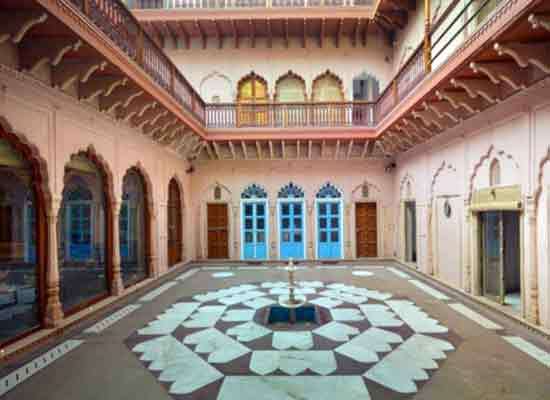 These rooms are divided into Jharokha Rooms (3), Diwan E Khas Rooms (4), and Shahjahan Suites (6). The décor of the rooms is wonderful and carries an old-world charm. The list of modern facilities in the room include Satellite LCD TV, Tea/Coffee Maker, Electronic Safe, Hair Dryer, Mini Bar, Telephone and Wi-Fi. The attached bathroom is clean and comes with complimentary toiletries. Lakhori Restaurant and Rooftop 'Baradari' Restaurant are the 2 dining venues here where the guests can relish lip-smacking delicacies from Indian, Mughlai and Continental fares. The menu also includes local street food. Enjoy your meal made from freshest of aromatic and tasteful ingredients. Enjoy the best of hospitality by the staff members. Delhi is segregated into Old and New Delhi. The Old Delhi attracts a huge number of travelers from around the world who wish to get a sneak-peak into the rich past of the country’s capital. Jama Masjid, Gurudwara Sis Ganj Sahib and Lal Mandir are some of the popular attractions here. Do not miss visiting the local bazaars stuffed with some amazing books, food, clothes and jewelry.